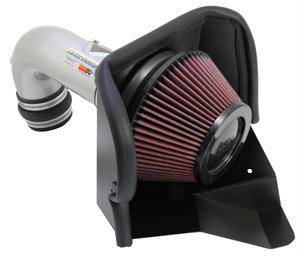 K&N 69 Series Typhoon Cold Air Intake System for the 11-16 Scion tC (tC2) 69-8616TS. The K&N 69 Series Typhoon Cold Air Intake System has tested at 6.06 HP @ 5712 RPM on your Scion tC. Available in powdercoated silver; purchase one today!! Built for performance and show, the Typhoon Air Intake System is a free-flowing mandrel-bent aluminum tube induction system designed to fit many sport compact performance vehicles. Typhoon intakes come in one of three designs; cold air intakes (CA), short ram intakes (SR), or complete cold air (CCA) intakes which can be configured as either a cold air intake or a short ram intake. Some Typhoon's have high quality finish options including polished aluminum (part ends with TP), powder coated blue (part ends in TB), powder coated red (part ends in TR), and powder coated silver (ends in TS) among others. K&N intake systems replace your vehicle's restrictive factory air filter and air intake housing. K&N intakes are designed to dramatically reduce intake restriction allowing more air flow to your engine. More air means more usable power and acceleration throughout the engine's RPM range.